Instagram wants to diversify its revenue stream beyond just advertising by allowing users to customise and purchase physical copies of photos on the app. During this two week sprint, I worked alongside two other UX designers to deliver a high fidelity prototype of a print functionality within the Instagram application. In the last few years Instagram has become one of the most popular photo sharing platforms available, with over 500 million users to date. As a free community, the sole source of revenue for Instagram is currently ads. But what would an alternative avenue be to generate profit? Instagram is a platform where 95 million photos and videos are uploaded daily (source: Forbes online:Instagram, The $50 Billion Grand Slam Driving Facebook’s Future). Focusing on the content generated could provide the answer, as well as looking at the habits of Instagram users beyond the app. Is there still a demand for physical copies of photos in the digital age? To verify that this would be a valid avenue for Instagram to follow, we started our research by conducting a simple 5 minute survey on current photosharing habits. The results were encouraging: Out of the 110 people surveyed, a 65% had printed a photo in the last year. Looking at the current competitive landscape also provided great insights on the services currently available, which at the moment cover two general areas: Specialist websites/communities with print shop functionalities used by professionals in the area of photography, illustration and graphic design, and commercial printers that focus on more general printing needs. 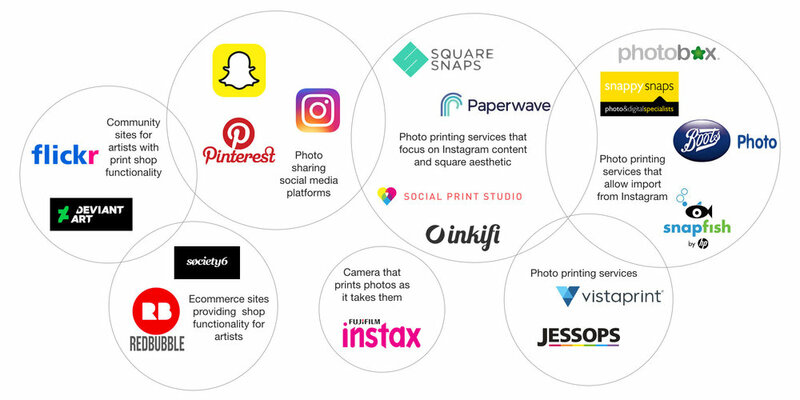 A closer look provided further encouragement that a printing service through Instagram would be a valid avenue to generate profit: There were companies that emerged thanks to the rise in popularity of the social media app, and that very much follow the clean square aesthetic of Instagram. In addition, many established commercial printers have an ‘import from Instagram’ functionality. Through a series of user interviews we found out more about the photo sharing habits of users and delved into the specifics of their habits and paint points. Many used Instagram as their primary photo sharing app. Our questions focused on the content they like to follow and share, their likes and dislikes regarding photo sharing and Instagram specifically, and also their printing habits: how often they printed photos, who they chose to print with, and what kind of content they chose to print. Our findings confirmed that the vast majority of Instagram users like printing a physical copy of their photos for personal use, to capture a memory. In addition, certain creatives primarily print copies of their work to sell. Vicky, the 18 year old student and avid social media user. She is an occasional printer, primarily due to a restricted budget and not knowing where to go. She prints her memories with friends and family now that she studies abroad. Anna, in her mid 20s. She uses social media often and has a diverse follow/follower base, based on her diverse interests and hobbies. She prints often, both personal photos as gifts and mementos, as well as purchasing prints from artists she likes. Gabriel, in his 30s, who is extremely interested in photography. He uses Instagram as a portfolio of his own work and only prints when planning to sell his photography work. He would like the option to sell his work directly through the Instagram community. Out of the 3 personas, Anna was chosen as the primary user, as she’s a prolific user of Instagram and a prolific printer, prints both for personal use and purchases art prints, and would most likely promote the service to a wide and diverse network. Her needs from a photo printing function would consequently cover the needs of the two secondary users. To add further emotional context to Anna’s printing experience and determine any pain points, we used stories and scenarios. For her user journey, we created a hypothetical scenario where Anna wanted to buy her mum a thoughtful gift for her birthday, to remind her of pleasant memories. Tracing her journey helped identify the problems faced in the current process of ordering photos, and how this could be addressed through an extension of the Instagram app. When deciding to print something, Anna finds searching for the right company frustrating, and thelongwinded process of uploading photos, editing them and then going to check out becomes a bit of a chore. She needs a quick and easy way to order prints. Allowing Anna to print directly from her Instagram feed will save her the time it takes to find the right company. Mirroring the familiar, easy and quick Instagram editing process will take the pain out of this journey. With the findings provided by competitive analysis and user research, we started translating user needs into features. Feature prioritisation helped determine which of the needs were a primary need for the app to cover and which had to be put on the roadmap for future iterations. Main features included a clear link to the ‘Instaprint’ function of the Instagram app, a variety of products and inspiration to chose from, the ability to pick photos and edit using familiar Instagram conventions, the ability to preview the product prior to purchase, and a quick checkout and tracking functionality. Sketching Anna’s user flows helped us start considering screens and how she would accomplish certain tasks within the app. Design studio provided a great tool to visualise these steps. As a team we explored various ways tasks could be completed, and going back to Instagram conventions helped ensure these remained familiar to the user, thus making the app familiar to the user. A clickable low fidelity prototype was generated to start gathering feedback from Instagram users on whether certain functions were easy to understand and use, the language and buttons were clear and consistent, and the navigation was familiar and enabled them to move quickly through an action. Further feedback and testing helped refine the prototype and add more fidelity to each iteration. It also ensured that the app made sense to an Instagram user and no elements were ambiguous or confusing. For example, the initial button for the Instaprint function was a stack of polaroid prints. However this wasn’t particularly visible and clear to users, as they felt it didn’t convey printing. This was replaced with a printer, which users recognised as a clearer way to convey the service provided. The high fidelity prototype of the Instaprint printing functionality on Instagram can be accessed here. Tracing Anna’s experience on this, she can now either select images from her own feed or images from another account she likes on Instagram, select the type of product she wants printed or browse inspiration, make any edits, preview her product and purchase it. She can also then track or repeat previous orders through her account. Accessibility testing of app, especially with users that have visual impairments and dyslexia. Development of Instaprint app for use on other popular mobile platforms (such as Android) and refinement of desktop version. Exploration of high res upload capabilities and copyright restrictions for ‘shop’ functionality, for users such as Gabriel that are interested in selling their work.